"Don't be frightened ma'am, remember our southern chivalry—we never shoot women or children, well, anyway, women." Someday-to-be-President Ronald Reagan and Bruce Bennett (The Fiend of Dope Island) play brotherly rivals in this 1951 Civil War western adventure. 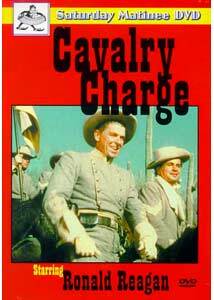 Released in 1951 as The Last Outpost, it was reintroduced to US theaters in 1962 as Cavalry Charge. Reagan plays Vance Britton, a Confederate captain leading a regiment who have been capturing Union gold and disrupting trade along the Santa Fe Trail near the town of San Gil. His humiliating exploits have come to the attention of the Yankee high command, who send out a colonel, Vance's brother Jeb (Bennett), charged with taking care of the problem. Upon his arrival at the local trading post, he is greeted by a group of soldiers, returning home on foot after being caught with their britches down. Sam McQuade, the powerful owner of the trading post, urges the colonel to enlist the aid of the Apache to quell the rebels, but Jeb objects to the idea. McQuade is a jealous husband, who suspects Jeb is his wife's former fianc&eqcute;, so invites him to dinner as a setup, but his surprise is quashed when he learns he has the wrong brother. Still unaware of Vance's involvement, Jeb sets out to ambush the Confederates, and finally comes face to face with his sibling, who learns of Julie's proximity in town. When Vance decides to pay her a visit, she must control her feelings towards the rebel. Meanwhile, McQuade has used his influence in Washington to have a negotiator begin talks with the Apache, but when things don't go quite as planned, the lives of the townfolk become threatened, as an Indian war party descends to collect scalps. Cavalry Charge was an enjoyable, but basically stock western. The acting is fairly even throughout, not exceptional, but in keeping with the tone of the picture. The script is infused with a good deal of humor, which is primarily given to Reagan's character, and he rattles off the one-liners slicker than a politician. The plot develops well, and sets up the inevitable confrontations. Action is bountiful, and romance is high on the agenda as well. The climactic sequence is well executed, and the end wraps things up in the good old Hollywood way. While it won't win any awards for originality, it makes a good Saturday matinee picture, just like the cover says. Image Transfer Review: While there is some minor color shifting, image quality on the whole is respectable, with good saturation, solid black levels and a fairly sharp image. Grain is well rendered. The source is in fairly rough shape; print damage is mostly an abundance of streaks, scratches and specks, but there are dozens of jump cuts, and in some segments the frame rate has been altered to fit space. That said, this looked a lot better than I had expected. Audio Transfer Review: Mono audio is limited in frequency coverage, without being tinny. Sync is often a problem. There is a constant level of hiss throughout, and some edginess and distortion on some dialogue, which is easily discernable. No excess sibilance is present, and tone is even. Pops and crackling are present throughout, but nothing that unexpected for a film this age. Extras Review: No matinee would be complete without some additional features, and a trio of these have been provided. First is the 09m:42s Crossroads to the Orient, a documentary on Jamboanga and Jolo, two islands in the Phillipines where, despite the ravages of war, life exists as it has for centuries. Next comes the animated Adventures of PowWow (05m:30s), which tells the story Why Burly Bear Likes Honey. The final piece is the complete first episode of the Buck Rogers Serial, Tomorrow's World (21m:00s). While flying through a blizzard in 1938, Buck Rogers' dirigible crashes, but releases a special gas that puts the occupants into suspended aninmation. When they are finally discovered, the year is now 2440! Cavalry Charge was a fun Civil War adventure, and while the print did have some substantial damage, was in surprisingly good shape. The disc's bonus features were also welcomed, adding to the overall value. Though none of the content is exceptional, I am impressed by the effort to make this more than just a bare bones release of a B-grade picture.